FBI and CIA embrace homosexual movement. While you weren't looking: FBI and CIA embrace homosexual movement. Reaching out to "gay and transgender community." Watch for crackdown on pro-family groups. The US military and State Department aren't the only branches of the US government to "go gay." Since the Obama Administration took control, the FBI and CIA, the two main federal law enforcement and surveillance organizations, have fully embraced the homosexual and transgender movements, and appear to be poised to crack down on pro-family groups and citizens who are critical. From the FBI's "careers" website. For example, the FBI is actively recruiting homosexual and "transgender" employees and agents. The FBI's "careers" website now boasts a page advising potential (and current) job applicants. Q. Can you be gay and work at the FBI? A. Yes. The FBI does not discriminate against a person's sexual orientation with regard to hiring decisions. To be sure, the FBI has open lesbian, gay, bisexual, and possibly transgender employees, as well as an LGBT Advisory Committee. The FBI welcomes and appreciates the contribution of its LGBT employees. Q. Can you be gay and be an FBI Agent? A. Yes. In fact, you can be gay in any position within the FBI. Q. 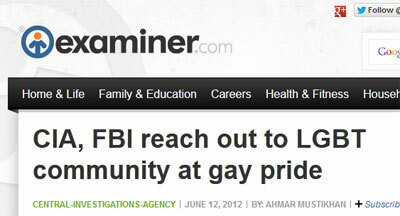 Does the FBI celebrate PRIDE? A. Yes. The FBI recently held an informal reception at FBI Headquarters and was proud to have Congressman Barney Frank as its speaker. Also, individual field offices are encouraged to have their own celebrations, educational presentations, or participate in LGBT community events. Q. Does the FBI have an LGBT Advisory Committee? A. Yes. 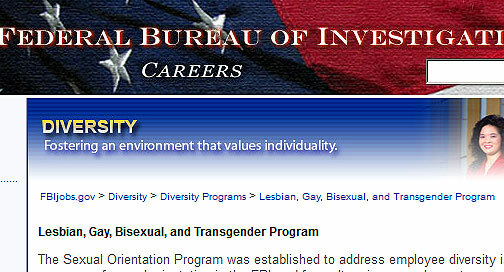 The FBI recently formed the LGBT Advisory Committee under the Office of Equal Employment Opportunity Affairs. The committee is composed of both Special Agents and support employees and is represented by gay, straight, and lesbian employees. The committee's members are from all over the United States. The purpose of the committee is to listen to the voices of the FBI LGBT employees and communicate concerns, policies, and ways in which the FBI can recognize its LGBT employees. The committee meets telephonically each month to discuss old and new business and meets twice each year at Headquarters. Q. I'm not out at work, but I want to be. Does the FBI provide assistance with coming out? A. The LGBT Advisory Committee, as well as the employee assistance programs and counselors, are available to employees who need assistance with coming out or adjusting to being openly gay at work. The CIA and "gay pride"
The Central Intelligence Agency (CIA) has actually been involved with the homosexual movement for over 15 years, according to its website. The CIA boasts about its internal organization called the Agency Network of Gay, Lesbian, Bisexual and Transgender Employees and Allies (ANGLE). ANGLE helps recruit LGBT employees and sets up CIA Pride Month celebrations at various CIA offices around the country. In further celebration of Pride Month, the CIA participated in Capital Pride's Festival, the annual LGBT celebration in Washington, D.C. The annual event is the third largest Pride festival in the country, attracting more than 250,000 people. Officers from ANGLE, the Center for Mission Diversity and Inclusion, and the CIA's Recruitment Center discussed career opportunities at the Agency as well as efforts to create an inclusive and supportive environment for LGBT employees. Perhaps the most outwardly frightening aspect of the FBI is its official partnership with the Southern Poverty Law Center (SPLC), which is itself a hate group desguised as a "tolerance" group. The SPLC has defamed, libeled, and outwardly lied about hundreds of pro-family groups and individuals, in addition to immigration reform groups, religious groups, people in conservative media, and even members of Congress. The SPLC has created and advertizes its bizarre and offensive list of those it labels "hate groups," "extremists," and "domestic terrorists" that even includes the Tea Party. Most recently, pro-life activist Peter D'Attilio, who simply holds signs and leaflets, has been informed by police that he is on an FBI terrorist watch list. The Family Research Council's offices and a guard were shot by a gunman after the SPLC labeled them a "hate group." Going after pro-family groups and citizens? 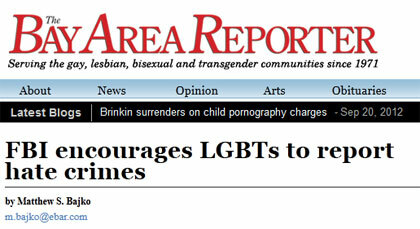 So when we start to see headlines like these in homosexual publications, we get concerned to say the least. At the gay pride event, according to the press reports, the person running the CIA booth told people, "The CIA headquarters will soon have two unixex restrooms." The FBI's parent agency, the Department of Justice under Eric Holder, has gone to extraordinary lengths to promote the LGBT agenda. 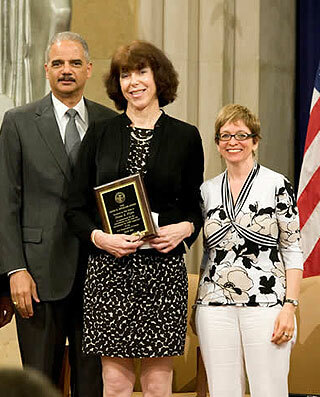 This summer Eric Holder personally gave a top DOJ award, with great fanfare, to a "transgender" DOJ attorney - a man who dresses as a woman. In particular, this man is helping sue school districts that don't sufficiently implement pro-homosexual "anti-bullying" programs. Not your father's US Justice Department. Attorney General Eric Holder presents special award to DOJ attorney and transgender activist Diana Flynn, a man wearing women's clothes, during the DOJ's LGBT Pride Month program. At right is Chai Feldblum, radical lesbian activist and Commissioner of the EEOC. DOJ Blog: "The Power of Out"
The newest U.S. Department of Justice logo. Will a Romney administration stop this? There's no question that Barack Obama is more aggressive at pushing the radical homosexual and transgender agendas than anyone could possibly have imagined. The fact that the mainstream media (and most of the conservative media) is almost completely silent about this gives him even more cover to continue. In a second term, it would unquestionably get even worse. Would Mitt Romney be like Obama in this regard? Or would he put a stop to, or roll back, what Obama has done? When Romney announced to a national audience that he would support "gay rights" and in effect be the most pro-homosexual Republican president ever, that didn't give us much confidence. Plus, he supports "gays" in the military. We'll see what happens.